To begin with, HYDAC assures a controlled safety through controlled diagnostics, thanks to our range of measurement, display and analysis tools. The universal display unit HDA 5500 provides a means of visualising and processing the signals from our sensors. The unit is for front panel mounting with standard cut-out 92 x 45 mm. 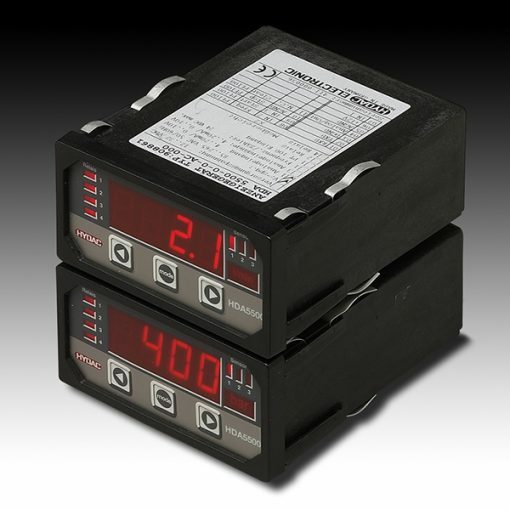 Also, the digital display units in the HDA 5500 series are microprocessor controlled display and monitoring instruments for control panel installation. Furthermore, different versions are available with a maximum of 3 analogue inputs, an analogue output (4 .. 20 mA or 0 .. 10V) and up to 4 relay outputs. The analogue input signals are displayed according to the settings selected by the user. Therefore, each of the relay outputs can be allocated to each of the sensor inputs or to the differential between input 1 and 2. A PT 100 temperature probe can be connected directly to the instrument. What’s more, there is an option for frequency measurement using the HDS 1000 (HYDAC rpm probe), for example, to measure the speed of rotating components. Furthermore, depending on the model, it is also possible to connect SMART sensors (condition monitoring sensors). SMART sensors are a generation of sensors from HYDAC which can transmit several different measured values.